Europeans always assume that printing with moveable type was invented in Europe by Gutenberg and we ignore far eastern history. Actually printing with moveable type was first done in China around 1050 AD, at first with wooden characters but they were not durable so after a couple of decades they started making the characters from clay (i.e. ceramics). I'd hate to be a party pooper… but copyright? Also, Martin Andrews from Reading University is in this! There may be even more to take into account. 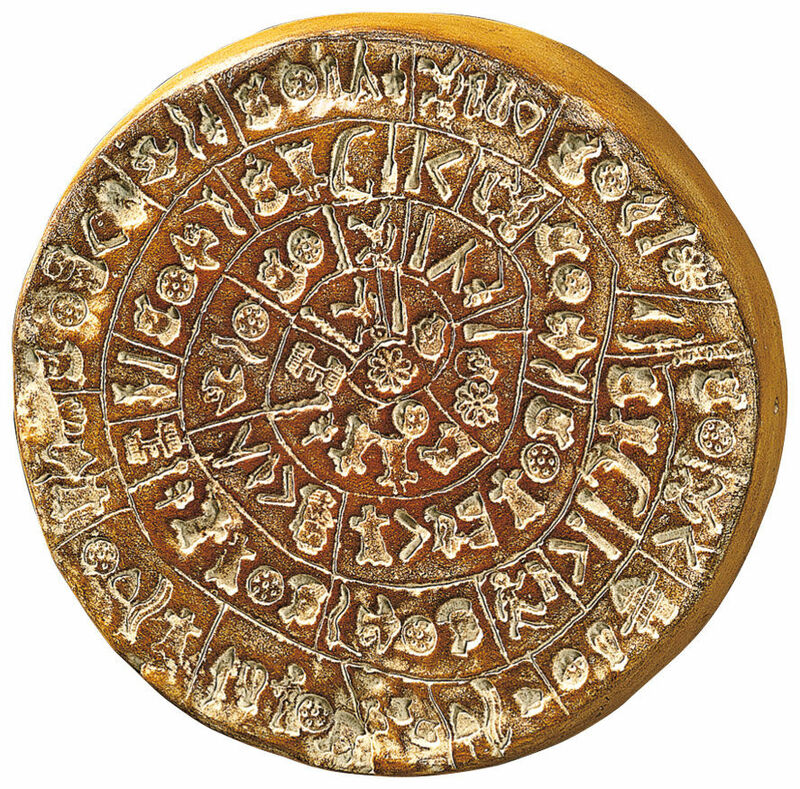 The Phaistos Disc is supposed to be some 3.500 years old. To me that is ‘printing with movable type’. I recall I have seen similar stamp prints on old ceramic vessels (but fail to remeber where it was). The Gutenberg revolution consisted of several parts which were to put together to form a technically viable set of operations. Printing already existed in those days, paper already existed, presses already existed. To cast metal already existed. But to make punches for letters, to cast them in a proto-industrial way, to arrange them mechanically to lines of text and the lines to columns – and to combine this achievement with all the other parts of the process, that was the actual bite. The difference between moveable type and stamping in clay or another medium is that the former involves multiple copies of each sort that can be composed to set text that is then printed, while the latter typically involves single sorts that are impressed into the clay multiple times in order to create the text. Pretty much every book I've read and documentary I've seen on the subject mentions Chinese and Korean printing from moveable type as predating the European invention. Many things are independently invented in different places at different times. For instance, the current thinking is that writing was independently invented in multiple locations. And the reproduction of the Gutenberg press made in the documentary now lives in the typography department at Reading. While I am one who always will mention that Korea was the first inventor of metal moveable type, the importance of Gutenberg's invention cannot be understated—not because it was the first, but because it worked in conjunction with other technologies to enable high-speed printing. In Korea, even with fabulous metal type, printing was hand-done, one a page at a time, and only on one side of the page (paper couldn't support ink on both sides). It was a time-intensive and expensive process that was only possible with government support. As I recall, most populist books were transcribed. Thus, the introduction of European printing presses, paper, ink, etc. (by Christian missionaries) allowed printing to be faster, cheaper, and enabled printed books greater availability. Of course, that didn't solve the question of accelerated typesetting of Korean—an issue only fully resolved with the invention of computers. Movable type in China was invented indeed a few hundreds years before Gutenberg, but it did not enjoy widespread use due to the complexity of the script itself. Carter in his The Invention of Printing in China and its Spread Westwards did mention that a Sung Dynasty official did make a large font of cooper type, but it seemed a bit of a luxuriously funded passion project. The complexity proved such an overwhelming difficulty that it was the anglophone missionaries in the 18th century who managed to eventually crack it with lead and matrix. So the more important point I would like to make is that Chinese movable type, at its conception, was quite different in the process than its European counterpart. Nobody in the Sung Dynasty thought of breaking down characters by morphological type, or sorting them by radicals and other types of components—a method which, again, was conceived first by the bible-printing missionaries. Unitization and systemization on the printing level did not happen, and so for a long time Chinese movable type was entirely engraving negative images, lacking the counterpunching, punching, striking and justifying steps. If the highlight of Gutenberg’s invention was that it greatly improved efficiency, then the Chinese invention did almost nothing in that regard; block-printing was efficient and beautiful enough. A History of the Old English Letter Foundries). These chapters usually discussed the printing of seals into clay in Ancient Egypt and Mesopotamia, but also mentioned a letter of Cicero’s, in which his ruminations came very close to describing the system of type-making and printing ascribed to Gutenberg, which of course were only realized a millennium and a half later. Quintilian is also cited, etc. These authors’ point, I think, was that the idea of printing with moveable metal type was not inherently novel in-and-of-itself, but that Gutenberg (presumably) was the person in the west to successfully put the theory into practice.